The NJ Division of Fish and Wildlife's Turkey Restoration Project represents one of the greatest wildlife management success stories in the history of the state. 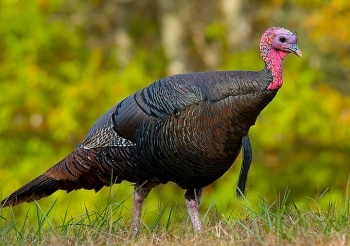 By the mid-1800s, turkeys had disappeared in New Jersey due to habitat changes and killing for food. Division biologists, in cooperation with the NJ Chapter of the National Wild Turkey Federation, reintroduced wild turkeys in 1977 with the release of 22 birds. In 1979 biologists and technicians began to live-trap and re-locate birds to establish populations throughout the state. 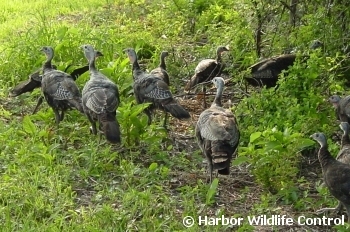 There is now an abundance of wild turkeys throughout the state with turkeys found wherever there is suitable habitat. Even in South Jersey, where wild turkeys had been struggling just a few years ago, intensive restoration efforts have improved population numbers significantly. The population is estimated at 20,000 - 23,000 with an annual harvest of more than 3,000. In suburban areas, turkeys not subject to hunting pressure may appear tame and may be more prone to inflict damage to golf courses, gardens, and lawns. Sometimes during the spring breeding season, turkeys in suburban areas are reported pecking at cars, and chasing or otherwise intimidating people. Large, shiny objects such as cars or windows may prompt aggressive behavior by males during the breeding season. Because wild turkeys have a "pecking order", they may respond aggressively to reflections or images of turkeys. Turkeys are probably not self-aware and do not recognize their own image, so will respond to a reflection as they would an intruding turkey. Human-habituated wild turkeys have been known to peck at windows, automobile mirrors, or reflections in shiny surfaces (such as polished car doors). Since the stimulus to drive away or subjugate the "intruder" is a strong one, and since the reflection does not disappear or cower when the turkey confronts it, the bird will often continually display towards or attack the reflection until changing light conditions cause it to vanish. The turkey will often remember the "intruder" and return to the same spot and continue the behavior even if repeatedly chased off. The reflectivity of the window, vehicle, or other shiny object must be changed or covered up in some fashion in order to stop the turkey from pecking at it. Aggressive dogs on a long leash can be effective in keeping turkeys away from a particular spot. In fenced areas, such as some parking lots, dogs may be allowed to roam free and chase away turkeys at will. Turkeys can be very persistent, and efforts to control them must be just as persistent. The good news is that, unlike other species such as deer or raccoon, turkeys are not active at night. This makes it easier to confirm the source of damage and to develop solutions to reduce problems. The birds, if you’ve seen them on the side of the highway or maybe walking down an urban street, can be three or four feet tall and weigh up to 20 pounds. They can be very aggressive – especially if a person is not. And if you feed them, well, expect them to literally follow you.